From the Old English Tile Collection this classic Victorian flooring pattern is an authentic flooring pattern from a bygone era. 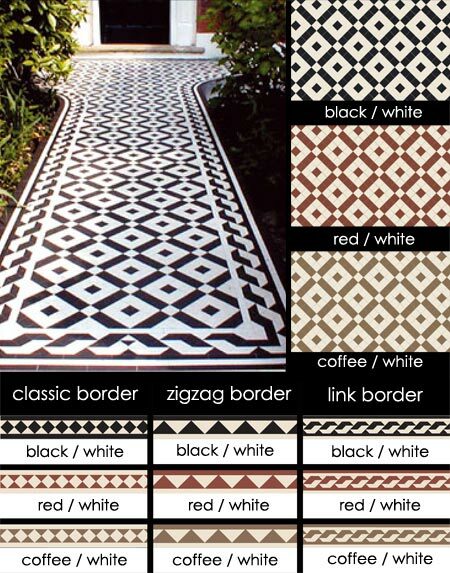 These geometric tiles are shown here in black and white mosaic pattern with a matching chain link border. These Victorian tiles are available in the general colours shown but we can also supply many other colour combinations to special order. * Photo shows black & white mosaic tiles. * Other colours to special order. * Geometric tiles are priced per m2. * Border supplied per linear metre.